One thing people may be quite pleased about is the fact that the hero of this game is Marth who, before this, had never appeared in a Fire Emblem game in the West, but was known about due to his inclusion in Super Smash Bros. Melee. Marth’s story is a sad one; he is the prince of Altea and at a young age the family’s castle is invaded and only he manages to get away while the rest of them are presumably murdered. He then goes far away, grows up and then gathers people together to reclaim his homeland. That’s a very basic outline of it anyway, there are so many areas where I could go into a lot more detail, but, I’ll let you discover them for yourself. 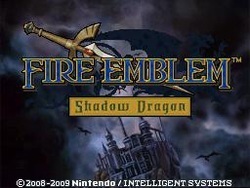 As with all Fire Emblem games, this is a turn-based strategy game with RPG elements. The game is broken up into various grid-based levels where you have to use the characters you’ve met and recruited to defeat the enemies and capture their base (which is done by defeating a boss character). But you don’t just have generic units in any of these levels, you only have characters you’ve met throughout the story and if any of them happen to be killed they are then permanently dead. Since this game is both very long and very hard, you’re not likely to get to the end without quite a few people dying and you’ll feel awful every time it happens. Every character has their own back story and their own unique relationships with different members of the group as well as their own experience levels, abilities and stats. So, if you have a favourite, you can spend time making sure that they become very powerful. But be careful not to put all your eggs in one basket, if that one strong character is killed, you’ll then have a great difficulty with later battles! As a nice little bonus, this game gives you the option to fight against other players either locally or over the internet. Online there is also a nice additional shop where rare items can be bought. However, the multiplayer is by no means a huge appeal of this game and you’re more likely to spend most of your time playing through the single player story mode. This is a very dark game and is even rather depressing at times, but that doesn’t change the fact that it’s very good. Between each stage you get to see these small kind of cutscenes which are usually dialogue based (no voice acting, though) and which do a lot to make the story much deeper and more compelling. The only real downside of this game is the fact that it is very hard at times. Either the difficulty will lead you to give up on the game, or it will lead you to try over and over until you finally get the huge satisfaction of having everybody survive through a level, which, a week ago seemed impossible to you.